SKU: DS-176. 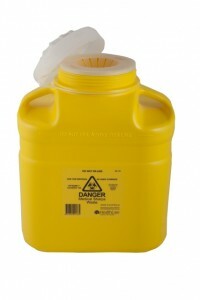 Categories: Clinical Sharps Container, Containers and Bins. Tag: Sharps Containers. DS-176: 12 litre Screw Top FITTANK™ Sharps Container with petal insert. Compact high quality all purpose blow moulded container.